Fans of Honda’s Integra automobile have reason to smile again because the automobile company has revived the Integra name from the past with its new Honda Integra half scooter half motorbike. 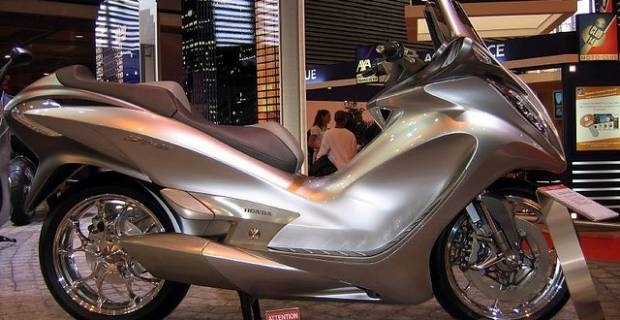 The Integra half scooter, half motorbike is slated to enter production and be available in Europe as a 2012 model. A notable feature of the new Integra motorbike is its engine and transmission. The new Integra motorcycle comes with a Dual Clutch Transmission engine designed for extreme fuel efficiency, while at the same time retaining the power and performance levels that have characterised other Integra models in the past. The Integra’s fuel efficiency is estimated to exceed 60mpg, which is more than the minimum fuel efficiency levels required to meet the economic realities of present times. · Branch in take port within the cylinder head to realise precise calculations of changes to combustion timing, thereby giving the engine a pleasing, pulsating feel. · And, Dual Clutch Transmission that is lighter, more compact and better equipped to detect different riding environments like mountain passes and City Streets and make the most appropriate automatic shift controls adjustments. With these specifications and its sleek design, the new Honda Integra half scooter half motorbike is expected to be delightful tourer for its owners.